I am very excited to continue this series of toucan species interviews today featuring a true toucan man named Jeff and his eclectic flock which just so happens to include some of the most fascinating-looking toucans of all the 38+ species – Curl-Crested Aracaris. But before we begin, just in case you missed them, be sure to check out these fun posts with our other toucan friends, Touk the Green Aracari, Pixie the Swainson’s, Pogo the Keel-Billed, and Yoshi the Emerald Toucanet. Curl-Crested Aracaris are among the largest in the aracari family, with an average weight of just under 10 ounces. They are found in a broad range of rainforest habitats throughout South America and are currently not endangered. Their colorful body, speckled chest, and curly hair-do make for one intriguing bird which many believe sets them apart as one of the most captivating of all the toucan species. I must say I have to agree. Jeff and his partner, Ken, are the proud owners of not just one, but five Curl-Crested Aracaris (or “Curls” as they are commonly referred to in the toucan world). They live in Northern California and their curly flock includes: Rocky, the “pet”, who is 4 years old and lives in a large cage in Jeff’s home office and spends most of his days out free-flying the house; Oskar and Shirley, 3 years old, who are a tame, hand-raised pair that live in an aviary attached to the house with access to Jeff’s home office through a window; and another non-tame breeder pair which are kept in a large aviary off-site. In addition to his Curls, Jeff also provides a home to an 8 year old female Eclectus, Ichigo; numerous songbirds; and breeding pairs of Blue-Crowned Hanging Parrots and Stella’s Lorikeets. Brazilian Cardinals and a White-Crested Laughing Thrush share the aviary with the Curl couple, Oskar and Shirley. I met Jeff through the toucan network of friends that I have been lucky to build over the past year. He is an amazing resource on All Things Toucan and I know you’ll enjoy hearing about his passion for Curls. Hi Jeff! You have quite the enviable flock. How did you first become interested in toucans? I can’t even remember how I first became interested in toucans. I’ve kept birds since I was a child – parakeets, finches, and so forth. I probably got it from my dad, who had a pet parakeet when I was a baby and was always fascinated by animals. When I lived in Japan in the 70s and 80s, I had a few large parrots, cockatoos, and lories. I think I ventured across Jerry Jenning’s website (Emerald Forest Bird Gardens) in perhaps 2006? I was intrigued by his description of the difference between toucans and parrots. What types of toucans have you owned? My first toucan was a Green Aracari, hand-raised by a breeder in Southern California. His name (the bird, not the breeder) was Frank and he was a great Ramphastid ambassador. When Tonia (current owner of Pogo the Keel-Billed toucan) was first thinking of getting a toucan, she heard about Frank from the Yahoo Toucans Ramphastid group and came to visit with her husband, Armando, and her sister, Emily. Frank won them all over. My sister, who lives in Milwaukee, met Frank and later went on to get a Green Aracari and a Swainson’s toucan. Another friend in the Bay Area also visited extensively with Frank before acquiring his own Green Aracari. After several years here, Frank made the final sacrifice and got adopted by a close friend in the area. I still see Frank regularly and he’s very happy in his new home. I’ve had three other toucans. My first larger toucan, Dino, was a very rare species – a Plate-Billed Mountain toucan. He was also bred in Southern California, though since then, all representatives of the species have been sent to the Dallas World Aquarium and no more remain in the pet trade. I have also owned a Swainson’s toucan named Jimmy and a Toco toucan named Daisy, who now has a Toco mate named Mario. Where did you adopt your Curl-Cresteds? How was your adoption process? I purchased my Curl-Cresteds from Jerry Jennings. Initially, I had purchased a non-tame pair to breed and set them up in the outdoor aviary adjacent to the house. At the time, Jerry had not yet succeeded in breeding Curls and no babies were available. Once Jerry had “cracked the code” and was producing a large number of Curl-Crested babies, he offered to sell me one. We named the new kid on the block Rocky, after the flying squirrel. He was very sweet and settled into our home easily. I eventually had the opportunity to purchase an unrelated pair of hand-raised Curl babies, Oskar and Shirley. I then transferred the wild pair to a friend’s breeding facility where they would have more privacy. I put the new pair of babies in my aviary adjacent to my office. They remain tame after several years and I occasionally open the window and let them into the office to play with me or visitors. I’m hoping that because they are used to people, they will feel more at ease breeding in an aviary in such close proximity to the house. Whenever I let Oskar and Shirley inside, they gather on the playpen on top of Rocky’s cage. Shirley, who is Rocky’s sister from another clutch, seems intent on murdering Rocky, so he has to be in his cage when the pair are in my office. Oskar and Shirley are presently courting and perhaps this year they will breed. Having two pairs of Curl-Cresteds, what are your plans in terms of breeding? Breeding is not my main goal, but I would like to keep this species going in captivity since they make such good pets. There are only a handful of breeders at this point and I’d like to do my part. What is a typical day in your life with your birds like? Each day starts with chopping fruit – if you’re not a morning person, don’t get an aracari. I usually have the birds fed by about 8:30 am. I let Rocky out in the morning while I’m preparing food to cruise the living room and spend time with Ken before he goes to work ( I work from home). When I go into my office, Rocky joins me there, going in and out of his cage freely, landing on my head, playing in the bookshelves, and banging his toys around. If it’s a sunny day, I give him a few hours in a (METAL) sunning cage on our deck. While he’s on the deck, I can let Oskar and Shirley inside. Birds generally rest during the mid-day period, being most active in the mornings and toward dusk. Rocky usually spends most of the afternoon in his cage, spacing out, by his own choice. Oskar and Shirley often retreat to their nest log in the afternoon for a nap. For some reason, Rocky seems to bathe late in the afternoon, almost every day. Oskar and Shirley usually bathe in the morning. No clue as to why it’s different. Rocky often joins us in the living room while we’re watching TV in the evening. He enjoys spending that time tucked into a little blanket someone made just for him. He seems to like being wrapped up. Occasionally, he pops out, takes a poop break on one of his special stands with trays underneath, then comes back. Are Curls noisy birds? What sounds do they make? They have a repertoire of about five calls that I’ve been able to identify. There is a sharp, loud, staccato warning call that can be irritating. They use it when fearful – a cat, a hawk, a new person, or a plane in the sky. They have a low, chortling sound that is their most frequent call, used as a greeting, it seems to me. They have a loud trill/purr/chatter that is used when happy – at having received some food or being reunited with a long-lost loved one (like after not seeing you for 30 minutes). They also have a soft, whining sound that is used when being stroked or petted – I believe this is probably the sound that chicks make to solicit food. And finally, they have a loud, car-alarm call probably most owners will never hear. It’s a high, descending whoop and I think it is used to call to flock members that are far out of sight. When I first put my wild breeding pair in the aviary, they did it for a few days in the morning. I think they were trying to see if any other Curl-Cresteds were in hearing range.Occasionally, my tame pair will make this cry in the morning, just once or twice. Even Rocky may do it in the morning if I have overslept and am not down to greet him at the usual time. He likes to sit on the back of the couch behind your head and preen your hair or have you reach back and stroke him in that position, to which he responds with baby begging sounds. He also likes his beak stroked or rubbed gently. If I take a short afternoon break from work, Rocky will join me on the couch, diving into a crack between me and the couch or me and the dog I’m sitting next to to sleep and be pet. It has taken him two years to get used to our newer dog. At first, he was afraid and a little aggressive, but now he simply walk up to him and stares or gives him a tentative poke in the thigh. The dog just looks at him like, “what, me, worry?” but we always supervise their interactions. Rocky also enjoys being hand fed tidbits of food. We keep a small cup of his pellets in the living room to hand feed him from time to time. He demands whatever you’re eating, so we usually cage him during our mealtimes – although he often manages to get a tiny piece of toast in the morning. Have you trained your aracaris to do any special behaviors? I haven’t trained Rocky to do anything. After the first year, he trained himself to poop on the two stands with trays that we have in our living area. He never poops on people or furniture. I haven’t trained him to “step-up” either – sometimes he will and sometimes I just gently reach for him and enclose him in my hand. When I need to put him in his cage, I make him fly to the couch and he waits there for me to pick him up. I suppose I could train him but…I’m too lazy and I don’t see the need. What is your favorite thing about Curl-Crested aracaris? Lots of things, actually. I find them stunningly beautiful and to be honest, that’s an important factor for me. They are also so affectionate and playful, without any of the common parrot problems such as biting, destroying furniture, feather plucking, or screaming. They are easy to care for and feed, and are happy to just sit playing in their cage most of the day in the presence of their human flock. They enjoy cuddling, but aren’t desolate if you can’t spend hours exclusively devoted to them, like some cockatoos would be. They are just so happy, cheerful, and easy to have around. They are also a species for which I think we humans can successfully meet their physical, emotional, and social needs, which is important. What would you say is the most challenging thing about having an aracari as a pet? Probably the most challenging thing about owning an aracari is providing it with a suitable home and keeping that home (and your home) clean. A large cage is absolutely necessary, and plenty of time out of the cage is a requisite. You also need to devise a way to keep fruit splatter under control. I use flexible plastic sheeting that comes in rolls around three sides of the cage to keep our walls clean and a sheet of Plexiglas sits on top of the cage. You still need to clean the walls and floors occasionally, as well as hose down the cage. They don’t eat much, so the expense of the food is minimal, but feeding aracaris is more trouble than just buying a bag of seeds or pellets, obviously. I’m feeding other even more labor-intensive birds, so to me, they’re easy. Additionally, I live in California where tropical fruits are readily and inexpensively available year-round. Would you recommend Curl-Crested Aracaris as pets? I would certainly recommend a hand-fed baby as a pet – if and only if you have the necessary time and space to fulfill its needs. On the other hand, if you’re simply going to park it in a cage all day while you’re off at work, I think a canary, parakeet, or cockateil is a more ethical choice for a pet. Aracaris are, by nature, much more social and deserve extended opportunities for interaction, ranging from focal to ambient attention (ie. just being in the same room as you). How do Curl-Cresteds rate in comparison to some of the other toucan species people might be considering? As for comparing them with other Ramphastid species, I would say that as one of the larger Aracaris, they approach the toucans in intelligence without all of the attendant issues that make keeping the large toucans as pets a bad idea for most people. It may just be my impression, but the Curl-Cresteds seem to have a bit more “presence” than some of their smaller relatives. Because of their physical uniqueness – larger size, relatively heavy bodies, bills shaped more like the toucans than the aracaris, and of course their unique, curly-feathered hair-dos – they were classified in a separate genus (Beauharnaisius) for many years, and though now they have been brought into the Pteroglossus (aracari) genus, in many ways they still seem rather transitional between Pteroglossus and Ramphastos, giving them an aracari personality in a toucan body. Perfect description – if only cassette tape also had body. It feels just like it looks – like little plastic curls. Their feathers are smooth and solid, without any barbs. They are shiny too, like little strips of black patent leather that you curled with scissors, as if making a bow for a Christmas present. I’d like to express my appreciation to Jeff for sharing not only a piece of his life with us in this interview, but also for always readily sharing his toucan expertise with me when I’m either in need or just simply feeling curious. His enthusiasm and wealth of knowledge have been so beneficial to me and I am so glad I was able to connect with him. All of the photos and video in this post were provided by Jeff. Best wishes to Jeff, Ken, and their spectacular flock! 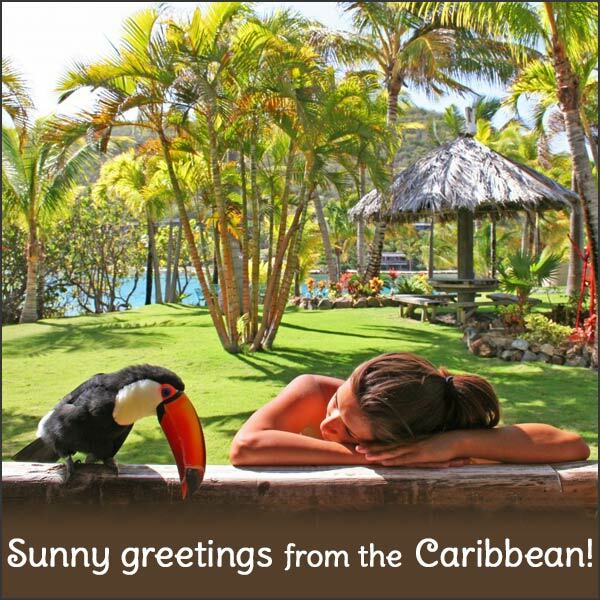 This entry was posted in Friends of Toucanland and tagged Adventures in Toucanland, Aracari, aracaris, bird, birds, BVI, Caribbean birds, Curl-Crested, Curl-Crested Aracaris, Curls, exotic birds, exotic pets, island, Oskar, Paco, Paz, Pepe, pet, pet bird, pet birds, pets, Rocky, Saba Rock, Shirley, Three-Cans, Toco, Toco Toucan, Tocos, Toucan, toucan species, toucanland, toucans, tropical birds, tucan, tucans by Toucan Lady. Bookmark the permalink. I have Tuki, a 4 year old curl from Jerry Jennings’s farm. She is adorable. She sleeps in her own little cat bed that looks like the hollow of a tree every night. Wants to taste all of our food. And cuddles with us in the evening before getting into her own bed. We love her to bits, and she greets us every time we come in the door. She has a different greeting for each one of us, and she recognizes each of our steps before we are in the house. I loved reading this interview. So fun and educational. I would like to point out that Touk used to share anything that he loved eating ie cherries, blueberries and grapes.. He would try to feed them to Marlean’s and my hand. He was the best bird ever.